I just wanted to let you know about a new tutorial video on How to install and use brushes in Photoshop Elements over on my Learn to Scrapbook in Photoshop Elements site. One thing that we were looking forward to at our new home was a double oven. After using 900mm ovens all our married life, I was a bit cautious of going back to a 600mm oven. Then once it was installed the oven never worked. Or rather the timer never worked – the click never lit up and the big oven wouldn’t turn on. Fortunately the top oven used an old school dial system so we can still use it. But as we speak I’m cooking a roast and it is a little squeezy. And muffins, well I had to cook them over 2 days as they grew to tall to have 2 trays at once. In general though I’m enjoying having a speedy little oven for garlic bread and the like. So after 2 visits from a tech and nearly 2 months waiting, we now have to have to WHOLE OVEN replaced. Oh well, it will be exciting to try my new oven in June! Being without an oven is nothing new, as we have incidents with gas bottles running out in Kalgoorlie, and then no oven during the renovation of our kitchen at Tindals Cres that took over a month, as Bunnings took ages to get our cupboards in. Phill did his bit in 1 long weekend, then were sitting around waiting for trades and those Flat pack cupboards. Enough with the negativity though, we are loving our new house, and enjoying making it a home. Oh and we finally bought a lounge suite. Everyone in Kal will be amazed, there is life after Stu’s couches! But that story is for a whole other New 52. Curious about New 52? Learn more about the New 52 challenge here. I’m finding that looking out for new experiences is helping me appreciate that my life is full of variety. 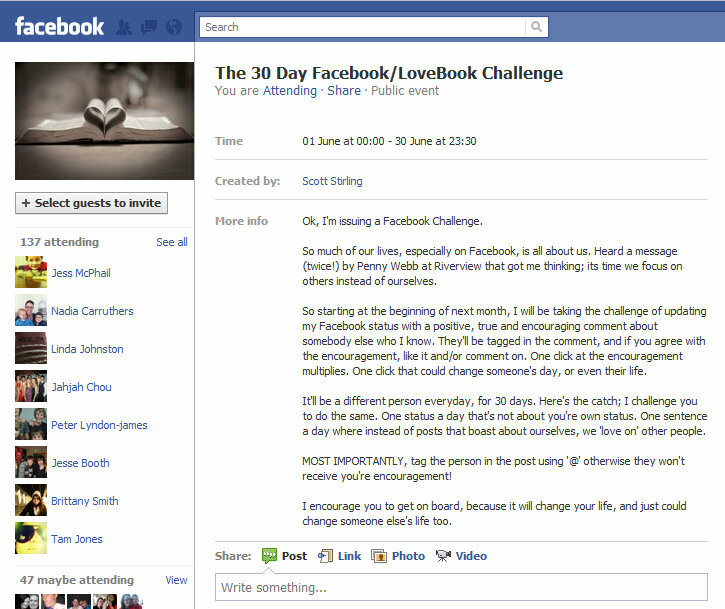 One of my friends on Facebook invited me to this challenge and I liked the idea so much I had to share it with you. Ok, I'm issuing a Facebook Challenge. So much of our lives, especially on Facebook, is all about us. Heard a message (twice!) by Penny Webb at Riverview that got me thinking; its time we focus on others instead of ourselves. So starting at the beginning of next month, I will be taking the challenge of updating my Facebook status with a positive, true and encouraging comment about somebody else who I know. They'll be tagged in the comment, and if you agree with the encouragement, like it and/or comment on. One click at the encouragement multiplies. One click that could change someone's day, or even their life. It'll be a different person everyday, for 30 days. Here's the catch; I challenge you to do the same. One status a day that's not about you're own status. One sentence a day where instead of posts that boast about ourselves, we 'love on' other people. MOST IMPORTANTLY, tag the person in the post using '@' otherwise they won't receive you're encouragement! I encourage you to get on board, because it will change your life, and just could change someone else's life too. Check it out and join the 30 day Love Book challenge with me! I'm in for the month of June - and while you are over at Facebook why not check out my Scrapbooking Classes page too? Welcome to the Color Combo Blog Hop! If you arrived from Digi Page blog you are in the right place! If you are here and didn’t come from the previous blog, I am listing the hop below my post so you can go start back at the beginning if you wish. We were all challenged to come up with a crafty project using the colour scheme on the left, from Inspired Bride. Stylish! Today I’m going along with the wedding theme and highlighting a card I made for a couple of weddings with this basic colour scheme. I used the card technique from Jessica Sprague’s Computer Tricks for Cards class I took last year. So I didn’t manage to sneak the mustard in there, but I think the scheme is near enough! The first card I made by the book. Using a dry brushing and bubble wrap plastic effect in pale blue then printing on the flower design and adding the embellishments. I used teal vellum, rather than coloured cardstock. I also only had narrow ribbon so I took two the light green ones and laid them side by side, then layered the deep teal one over the middle. Rather than using paint, for the second version I used a deep teal ink over an embossed cardstock. I also only had narrow ribbon (again!) so I took two deep green ones and laid them side by side, then layered the lighter brown one over the edges. Again I laid paper (brown mulberry paper) over the white cardstock card. This time I used a stamp and handwrote the couples’ initials on the accent piece. Want to see more? Head on over to Alysse's blog to continue on this fabulous colour combo hop! I really enjoyed mothers day morning this year – a little different from last year when Phill was on sound at church and I had to get a little almost one year old ready by myself! This year I had scrambled eggs and tomatoes made for me, but Phill and Emily’s plan for bringing me breakfast in bed was thwarted when I got up too early (well 7:15ish). 7th April – Happy Birthday Mummy. Emily still often says that if she gives me something! Like the letters for eg! We managed to sit through church happily, though Emily insisted I stop singing! lol Harsh! Emily ate lunch then had her sleep, then Phill headed off to his Aunt’s place to get some plants for our garden! Les was pulling out some Shasta daisies, agapanthas and gardenias, so we happily took them to plant by the side of our house. We are keeping all the plants together to make watering easier until we get the landscaping done. We were pushing it for time, but By 2:30 Phill and I were ready to go so we woke Emily, who ws still fast asleep! Emily was excited to learn that it was finally time to go out and see the Okelys. Of course Grandma Okely was the guest of honour, but Emily was looking forward to seeing the other rellies too! We enjoyed high tea, had the best time chatting and my brothers took some gorgeous photos! But thanks for the free USB drive! Do find the postage systems used my big companies confusing? I do! It seems like everything I order from Shutterfly gets posted individually too! But I’m not complaining – I love the extra mail! Just a quick note to let you know about my tutorial over at Learn to Scrapbook in Photoshop Elements. It’s all about how to use the dodge and burn tools in Photoshop. A tip for those doing some digital scrapbooking! If you want to learn more – why not head over and register for my latest free Photoshop Elements workshop that will be running in about 12hrs time! I'll have both a live feed of my screen so you can follow along and I'll also have the web cam on so you can see me and even watch me use my Wacom Bamboo Pen and Touch ! Fun stuff. More details about the live Photoshop Elements workshop here. April Self Portrait, a photo by mshanhun on Flickr. So I tried a slightly more coppery based tone in my foils this time (and dyed the underneath), just to give me a little change, but without having to cut my slow growing hair much. 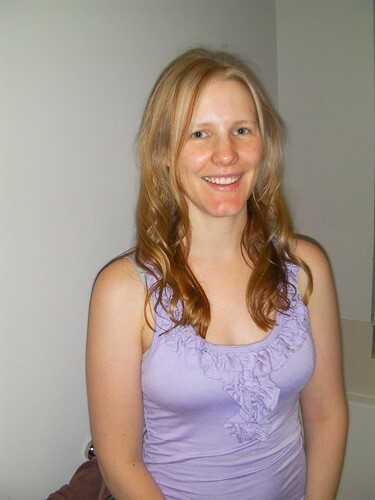 Thanks Carlie for the great job you did - I love having my hair all done for my birthday! Ali sends out monthly emails with a prompt for the month, and I’m working on my April one now. Did you know that the One Little Word class is still open? There are over 2000 people in the class and we’ve got heaps of good stuff going on in the forums! There’s even a specific forum for Growth related OLWs! If you decide to register at Big Picture using my link and purchase Ali’s One Little Word class (or any of the others! ), we'll both receive a code for 10% off** our next order. Of course you can always just sign up and select from one of the free classes. I am blogging about my progress in the classes I’m working on over at Big Picture Classes – so stay tuned! Are you working on any year long projects? Maybe this Paperclipping Roundtable Episode – Long Projects Chroncicled will give you some inspiration! I just had to share this funny video of our daughter Emily calling Ray (Grandad to you, young lady!). Getting him to clear away all of the dishes. After hearing Grandma call Ray to take across a glass - Emily copies much to Phill and Grandma's delight! It had us in stiches! PS Check out my free bonus workshop with purchase for National Scrapbook Day! You can stamp, mist and more without making a mess! If you have ever wanted to add more fun with ink and pain to your scrapbook pages, I have a fun live Photoshop Elements workshop coming up next week. In case you aren’t a subscriber over at my Learn Photoshop Elements site, here’s the scoop! Are you inspired by all the fun scrapbookers have with their misting, stamping, embossing and more? Do you want to learn techniques to use them on a digital page? Join me for a fun and (digitally) messy hour-long workshop! During this class you'll have a chance to see digital techniques in action and ask your questions live. Can't wait to see you there! Register now to secure your seat - you'll be able to peek over my shoulder and even see me using my tablet and mouse to create these effects live. Even if you are a paper scrapper, why not come along – I’ll show you how to add these effects to your photos, before you print them, as well as how to use them in an all digital page. PS Sign up to get notified of new Photoshop Elements workshops and receive a free digital scrapbook template!